Dinosaurs are perennial child favourites. Some young fans love to find new facts about their dinosaur of choice. Others love stories with dinosaur characters - the lovable, not the scary kind. Here are some newish dinosaur picture books for you to browse. loves to have fun! But sometimes he’s a little bit silly. Uh-oh! Dizzy needs our help ... again! My Storytime kids had lots of fun as they interacted with this cute children’s picture book. They tickled their parents’ tummies as a substitute for tickling Dizzy’s, they shook the water off themselves to help Dizzy get dry, and they roared out a big BOO to cure Dizzy from his hiccups. I think lots of kids will enjoy “helping” Dizzy in this large and colourful, easy-to-see children’s picture book. This is a cute premise, and one I believe children will totally relate to. A young boy wants more than anything to be a dinosaur so a dinosaur shows him the ropes. The boy loves all the roaring, stomping and chomping meat the pair do. But as the boy shows him what boys do - they eat not just meat but other yummy things, they read books, they play soccer and video games, the dinosaur decides that above all he wants to be a little boy. The ending is a joyous celebration of dino-boyhood. Exuberant illustrations add to the fun, and the hardback edition makes a sturdy product for home or library. Ten Tricky Dinosaurs: Written by Amanda Tarlau and illustrated by Karen Mounsey-Smith, Ten Tricky Dinosaurs was published by Koala Books for Scholastic Australia (2015). one let go — wheeeee! — and then there were nine! Follow this fun-loving group of dinosaurs as they get up to all sorts of tricks. A rhyming countdown romp from ten to one. Everyone is dancing at the disco. But then . . . The music stops. The ground shakes. Is the intruder looking for a dance . . . or his dinner? It’s Saturday night at the disco and we witness all the usual behaviours, the queuing, the foot-shuffling, the impressive dance moves from snappily dressed dinosaurs like Corythosaurus and Maiasaura. But then, what’s this? There’s a delightful build up of suspense, but even young children will suspect which dinosaur has stopped the music and made the ground shake. Kids will love the colourful and dynamic illustrations, and the rhyming text. There’s also a handy double page of dino facts at the back of the book that includes pronunciation guide for ignoramusauruses like me. If Dinosaurs fascinate your kids, be sure to look out for I’m a Hungry Dinosaur and I’m a Dirty Dinosaur. 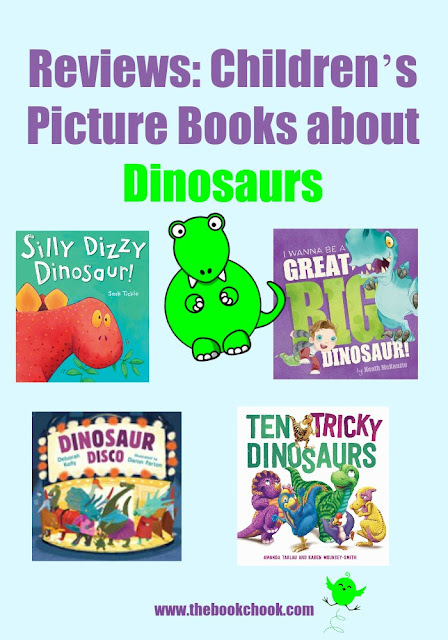 Find more children’s picture books about dinosaurs and other animals: Reviews: Recent Picture Books about Animals 2015, Reviews: Recent Picture Books about Animals 2015 (2), Reviews: Recent Picture Books about Animals 2015 (3), Dinosaur Books for Kids, Three New Picture Books about Dinosaurs, Letter to the Book Chook - Dinosaur Books. Find some of my articles about using animal resources with kids here.